SHE HAS played the piano dangling high from a crane in Sãu Paolo; she has played it while being pulled by a car past the canals of Amsterdam; but never let these distract from the fact that Daria van den Bercken is one of the most outstanding young classical pianists at work today. 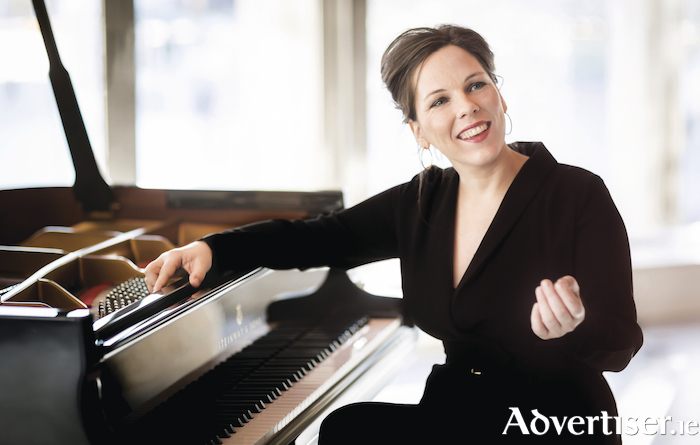 Her passion for the instrument eventually lead to her studying in the Indiana University Jacobs School of Music, and at the Amsterdam Conservatory; her winning the Dutch Classical Talent Award in 2006 and 2008, as a soloist and a chamber musician; and the prestigious Amsterdam Prize in 2012. She has since performed with the Rotterdam Philharmonic Orchestra and conductors Yannick Nézet-Séguin, Shi-Yeon Sung, and JoAnn Falletta, and the Arnhem Philharmonic Orchestra, while earlier this year she made her debut with the Orchestre Philharmonique de Radio France. However it is Handel who Daria will probably most look forward to playing. Over the last few years she has become a great enthusiast, and also evangelist, for his works (she will play his Suite in Dm 428 in Galway ) believing him to be one of most under-rated and under appreciated of major composers. In performance, a classical musician reads the score for a specific piece, unlike say, a jazz musician, or a blues or rock guitarist, they cannot improvise from it, or play around with it. So where is the room for a classical artist to add her personality and spirit? “That is a good question as it touches the essence of why I am a classical musician,” Daria replies. “A first response is that it depends on which music you play: baroque music demands an improvisational freedom from the musician, but also a certain taste: they ask that you add trills, ornaments and variations to your own taste to personalise the score. Whereas a composer like Debussy or Bartok asks monomanically for every detail to play the way he wrote it. And few classical musicians have ever performed the classical repertoire quite the way she has, take the by now legendary performances in São Paulo (being hoisted high into air via pulley, crane, and ropes ) and Amsterdam (being towed through the streets behind a car ), all while playing the piano. And so back to family and they impact they have had on Daria, the individual, and Daria, the musician. In a previous interview she said: “My sister once shouted out that I am like an ox who just keeps on bumping against the door to make it through it to be able to go on." Is that Daria’s approach to her art, career, and life? Daria van den Bercken plays a concert presented by Music for Galway, sponsored by KPMG, in the Emily Anderson Concert Hall, NUI Galway, on Tuesday November 21 at 8pm. Tickets are €20/18/16/6 via www.musicforgalway.ie, 091 - 705962, or O’Maille’s Original House of Style, Shop Street.